Zodiac Sign: I know what you’re thinking. Seriously? Astrology? Views on whether the planets literally influence the lives of mortals aside, the traditional signs of the Zodiac break human personalities down into twelve archetypes… and that ought to get any writer’s mouth watering. I like to choose an arbitrary sign of the Zodiac, not to force the character to conform, but to give me a quick and easy star by which to navigate the character conflict. %Extrovert/Introvert: How outgoing and proactive is your character? I choose a number to represent this, and try to keep it in mind as I wander through dialogue. 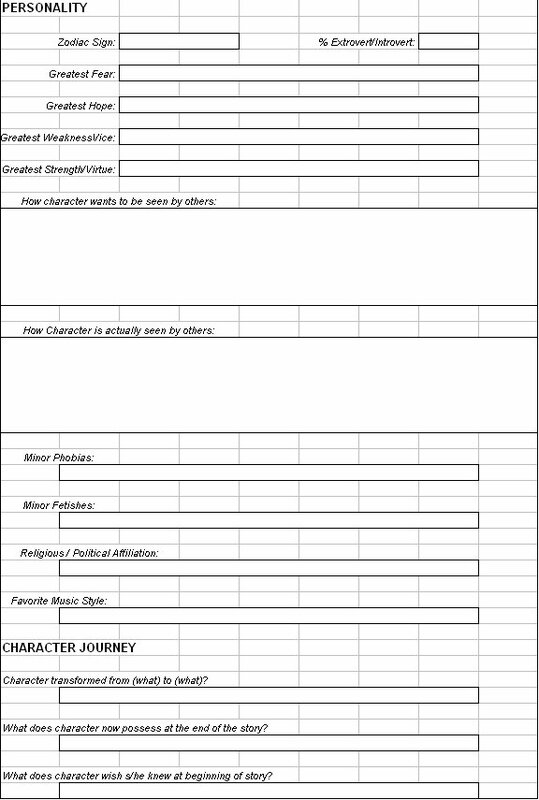 I find this especially useful for secondary characters. Greatest Fear: Name the one thing that would most devastate your character. Armed with this knowledge, you are poised to brandish this fear at your character. Repeatedly. Greatest Hope: Similarly, the character’s ultimate dream should be something the character continually strives for. Tempt the character with this hope. Dangle it in front of her to urge her forward. This makes motivation much easier to define. Greatest Vice: Keep this mundane. A vice is chewing nails, smoking, gambling, picking one’s nose, or picking others’ noses. It is thrown into the regular business of the prose between lines of dialogue and scene changes, and helps to ground the character in the mind of the reader. Greatest Virtue: This is something that is utterly redeemable about the character, which the character doesn’t necessarily work at. It’s a constructive element of the personality that comes naturally. Does he always drop coins into the cups of beggars? Does he tip heavily? Does he mow the lawn of the old lady next door? Does he invest? These are the things that help balance antagonists. That is, unless you’re shooting for a perfectly cartoonish villain. How Character Wants to be Seen by Others: This goes hand-in-hand with Greatest Hope, generally speaking, and defines the total package of character in the light of his hopes and ambitions, and helps to define the character’s “filter” from reality. How Character is Actually Seen by Others: Here’s where the filter falls away. This entry combined with the previous entry can arm you with truckloads of dramatic irony for your character, as well as empathy (or antipathy) from your reader. Minor Phobias: Do spiders give her the creepy-crawlies? Is he afraid of heights? These minor phobias often steer the character through the mundane business of life, and often present very real complications at the worst possible moments. Minor Fetishes: Unless it’s integral to the plot, this is something that might not manifest in the story. The question remains, however, what turns your character on? This need not be sexual in nature. Does the character get a thrill from eating a triple chocolate sundae? Driving too fast? Dressing up in animal suits and playing tic tac toe on the kitchen table with a can of aerosol cheese? Religious/Political Affiliation: We as human beings adore labels, particularly within a plural society. We carry within each of us a bevy of bias founded upon one’s own philosophies, be they political or religious. Depending on the story itself, this may be a very key, fundamental element to the plot. The more specifically you define their political and cosmological beliefs, the more concretely the character will present herself to the reader. Favorite Music Style: If you answer Country/Western, and the story takes place in Renaissance Italy, then you might need to be sure that time travel is a core plot element. Character Transformed from (what) to (what)? : This is a fill-in-the-blanks question. For any novel, you must have character development. Otherwise what was the point in the story? Most writers accept this on some level, but how deeply have you defined it for your character? Break it down simply. Your character began as a Blank, but has transformed into a Blank. Just fill in those Blanks. John transformed from a bigot to a compassionate husband. Judith transformed from a victim to an independent woman. Ughfrak transformed from a fifth-level demi-imp to a sixteenth level Demon Lord. What Does Character Now Possess? : Your character may win or lose. When you get into the secondary characters, particularly the antagonist, you will have to deal with at least one character coming out on the bottom. Win or lose, however, each character will possess some knowledge, understanding, or even an item which represents the transformation the character has undergone. John now has a Korean wife. Judith now has a blue belt in Jiu Jitsu. Ughfrak now has the Greater Turning Stone of Beelzuboom the Filthy. What Does Character Wish She Knew at Beginning of Story? : Part of the character’s journey should be painful. There should be failure, loss, even regret. And though our trials and tribulations define us and often make us stronger, we can’t help but to succumb to speculation. “Had I only known…” Define this speculation for the character. When the dust settled, what could have avoided all of this? Remember to keep this entry “filtered” through the eyes of your character. Next time we’ll discuss Speech, Mannerisms, and Wardrobe!